A 10-year-old boy is dead and a 6-year-old is missing after they were swept away while swimming in the Merced River. 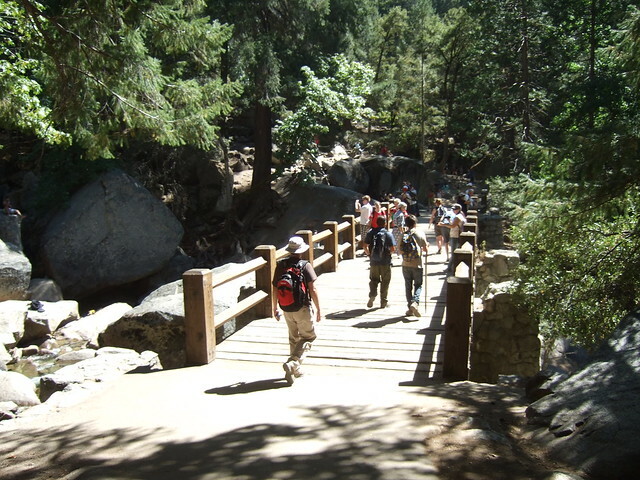 The boys were hiking along the Mist Trail with their family to Vernal Fall. Around 3 p.m. the boys decided to go swimming and hopped in the river by the footbridge. The river quickly swept the boys downstream. The 10-year-old was pulled out 150 yards downstream and where a park visitor quickly administered CPR. The boy was pronounced dead after further resuscitation efforts by park rangers were unsuccessful. A search for the 6-year-old was under way between the footbridge and the trailhead, a distance of about eight-tenths of a mile, according to park spokesman Scott Gediman. That section of the river is very dangerous and has been the spot of numerous fatalities. Caution should be used at ALL times while swimming, wading or walking along the Merced and streams in Yosemite. Granite becomes slick almost instantly when it gets wet. The rivers often hold underwater trees and rocks that are easy to get caught on and become trapped underwater. Photo by Rachael Moore via Flickr. The newspaper articles about this incident mention a drowning in June in Wawona on the South Fork Merced. Do you have a reference to that?